President George H.W. 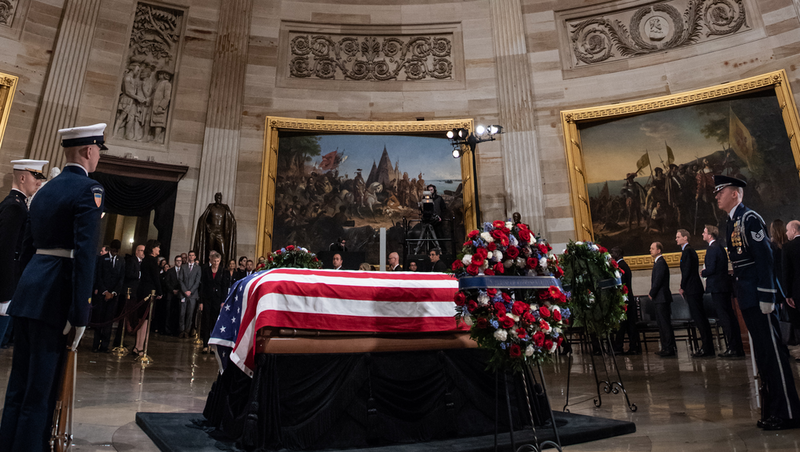 Bush lies in state at the Capitol. Photograph by Dana Barciniak. The passing of President George H.W. Bush – whom the nation mourned officially Wednesday – was a reminder of all that we have lost and that still remains. It’s hard to imagine Bush instituting tariffs that would destabilize world markets – much less referring to himself as “Tariff Man” – or blathering about “American carnage” or demonizing the opposition. Not that he was perfect. Far from it. He was associated with the Willie Horton ad, which linked Massachusetts Gov. Michael Dukakis – his opponent in the bitter 1988 presidential contest – with a convicted African-American murderer who raped a white woman and stabbed her partner while furloughed from prison on Dukakis’ watch. (It was a dog whistle that foreshadowed the Trumpian dog whistles of today.) Like Ronald Reagan, whose loyal vice president he was, Bush was at best indifferent to the AIDS crisis that emerged in the 1980s. And then there was Clarence Thomas. But though “an imperfect man, he left us a more perfect union,” biographer Jon Meacham said in his eulogy at Washington National Cathedral. Bush presided over the end of the Cold War and the Americans With Disabilities Act and, though he was a mass of contradictions, not the least of which were a self-effacing politician and pragmatic moralist, he was a collegial gentleman – and a gentle man – something for which we now desperately long. You could see it at the funeral, as magnificent it its way as John McCain’s was in its. There was pathos, yes, but there was also humor and grace. And something else – evidence that rivals can not only be civil but friendly, for when rivalry falls away, what remains is the passion for politics and service, the love, that the rivals once shared. Surely the tear President Bill Clinton shed at the funeral was proof of that. So many presidents in Washington Cathedral – five, well, actually, four plus one. President Barack Obama and wife Michelle greeted President Donald J. Trump stiffly. Bill Clinton glanced at Trump. Wife Hillary looked straight ahead. When you are only about yourself, you wind up by yourself, even in a crowded cathedral.